This report contains the 2014 “Phase 2: Implementation of the Standards in Practice” Global Forum review of Marshall Islands.The Global Forum on Transparency and Exchange of Information for Tax Purposes is the multilateral framework within which work in the area of tax transparency and exchange of information is carried out by over 130 jurisdictions which participate in the work of the Global Forum on an equal footing.The Global Forum is charged with in-depth monitoring and peer review of the implementation of the standards of transparency and exchange of information for tax purposes. These standards are primarily reflected in the 2002 OECD Model Agreement on Exchange of Information on Tax Matters and its commentary, and in Article 26 of the OECD Model Tax Convention on Income and on Capital and its commentary as updated in 2004, which has been incorporated in the UN Model Tax Convention.The standards provide for international exchange on request of foreseeably relevant information for the administration or enforcement of the domestic tax laws of a requesting party. “Fishing expeditions” are not authorised, but all foreseeably relevant information must be provided, including bank information and information held by fiduciaries, regardless of the existence of a domestic tax interest or the application of a dual criminality standard.All members of the Global Forum, as well as jurisdictions identified by the Global Forum as relevant to its work, are being reviewed. This process is undertaken in two phases. Phase 1 reviews assess the quality of a jurisdiction’s legal and regulatory framework for the exchange of information, while Phase 2 reviews look at the practical implementation of that framework. Some Global Forum members are undergoing combined – Phase 1 plus Phase 2 – reviews. The ultimate goal is to help jurisdictions to effectively implement the international standards of transparency and exchange of information for tax purposes. 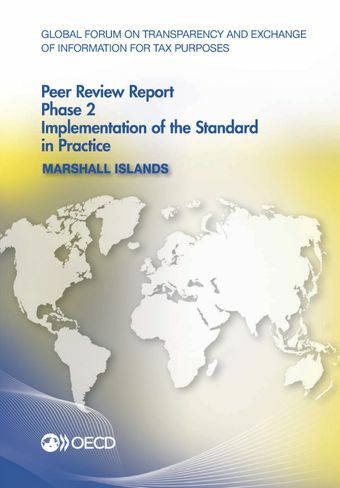 The Phase 2 review rates the Marshall Islands as overall non-compliant with the international standard. The Phase 2 review shows that the Marshall Islands experienced difficulties in obtaining and exchanging information for tax purposes during the three-year review period from 1 July 2012 – 30 June 2015. Although the Marshall Islands’ legal framework requires that ownership information, accounting and banking information is available for most relevant entities, there is a lack of effective monitoring and enforcement programmes in place to ensure that all relevant entities, in particular non-resident domestic entities, maintain and provide ownership and accounting information. In addition, bearer shares may be issued by non-resident domestic corporations in the Marshall Islands and there are no mechanisms in place to identify owners of such shares. The Phase 2 report also identifies deficiencies in the use of the Marshall Islands’ powers to obtain and collect information. This resulted in the Marshall Islands Competent Authority not always obtaining and exchanging all of information requested by its treaty partners. It was also recommended that since the Marshall Islands put in place a new process for responding to EOI requests after the review period, the Marshall Islands should monitor the practical implementation of the organisational processes of its exchange of information unit. Acknowldging the difficulties that arose during the review period the Marshall Islands has indicated that it will move quickly to address them so that it can avail of the Fast Track process that the Global Forum has put in place to facilitate jurisdictions that wish to improve their ratings. It will also sign the multilateral Convention on Mutual. Administrative in Tax Matters.For further information on the Marshall Islands’ exchange of information practices and to read the full report click here.